TEAM PROCOMP!!! WOW! What a day we had in Sydney at the 2018 WFF Ms Galaxy!!!! As coaches Blair and I could not have been prouder of the outstanding effort from our athletes and team. 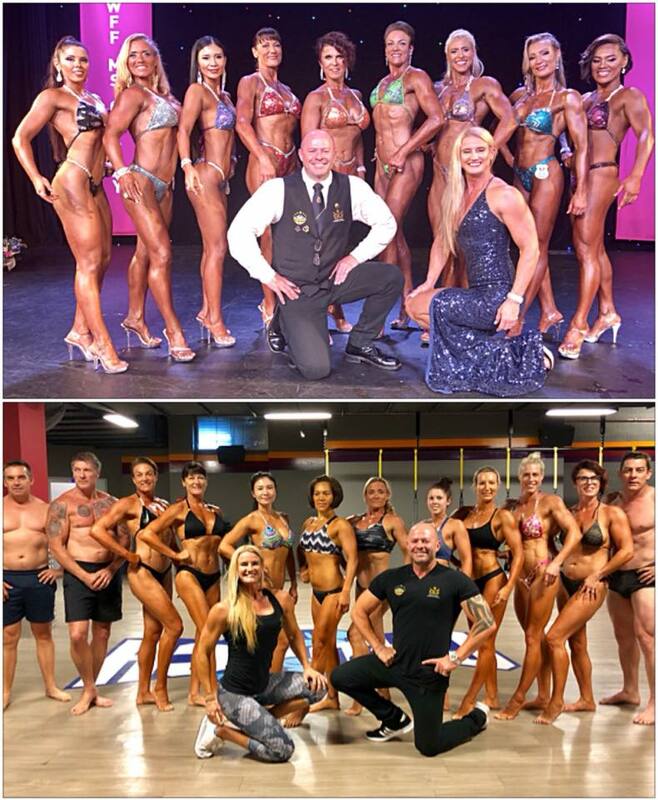 We spent the weekend posing, tanning, supporting and encouraging each other and we were just delighted with the wonderful results. KELLEE CAMERON PRO – Pro Figure Debut. Pure Pro material onstage and off. Such an inspiration to everyone. This is just the beginning of an incredible Professional career for Kellee. BREE GRIMA – 1st FIGURE SUPERBODY – and awarded PRO card. Bree’s conditioning was outstanding. Bree has stayed focused, determined and committed and has not waivered from the overall plan and goal. Bree is now ProComp’s newest and third figure pro and her journey has just started. MARIE LILJA 1st FIGURE MASTERS. Overall Amateur Miss Galaxy. What can we say about Marie? Marie has had to do some soul searching over the last 12 months always having some unlimited potential. She committed to her goals, her coaches, her family her friends and most importantly herself…….and she delivered the best package of her life. MING SEA 1st place over 30 BIKINI. AWARDED HER PRO CARD. 2nd place in the professional bikini division. Ming travelled on her own from Thailand and joined the ProComp Team for the final few days prior to the show. Ming also had the Australian Ministry of Thailand support her along with Thai dignitaries. Ming was absolutely delightful and is worthy of her professional status. CHLOE COLLINS-GILMOUR – 1st OPEN CLASS – Upbeat, bubbly, entertaining, enthusiastic and a delight to have on the team, Chloe has beautiful shape and a lovely stage presence and will be the next generation of figure superstars. JEANINE PIVA – 1ST EXTREME FIGURE. 2nd NOVICE – Such sass, such style, such presence on stage……and she has very good quality muscle and beautiful shape. Deserving winner of the extreme body class and with a few more shows under her belt, her potential is unlimited. Jeanine was supported unconditionally by her partner Rob who explained the definition of the word “Hangry” to the entire bodybuilding community. LEANNE FULTON – 2nd EXTREME BODY. 3rd NOVICE. ProComp’ most determined athlete and we could not have been prouder of Leanne. This athlete gave everything and more to this prep, she nailed her stage presence and delivered a beautiful figure and package. Her journey has just started. Leanne with her partner Rob, are the heart and soul of the ProComp team. CAT RICHMOND – 2ND SUPERBODY. Her fist time on stage and second in the open superbody class. Cat has been dedicated and committed throughout the journey and will continue to get better and better with each show. LEE COLLIER – 3RD FIRST TIMERS. She bought a lovey lean and tight package to the stage. She rocked the house with her energetic routine. Her physique was lean and hard and is a credit to all of her commitment and hard work that Lee has done to deliver an outstanding package onstage. Lee also had outstanding support by Wayne “handsome” Collier…….her biggest fan. We cannot forget the tireless work of the WFF crew. Paul, Con and Penny Gallanos the NSW presidents and promoters. Thank you for inviting the ProComp team to such a wonderful event and making everyone feel special and welcome. WFF International secretary Mr. Daniel Lancefield. Thank you for everything you do for the federation and the ProComp team. Danny D’Mello……WFF International photographer……and one of the good guys in the industry. WFF International World President, Mr Graeme Lancefield, thank you for creating the opportunity for WFF to shine and follow their dreams across the globe. To our ProComp touring coach, Mr. Dave Kirwin. No tour would be complete without you and we cannot begin to express our gratitude…. thank you. Our next event as the ProComp team will the 2018 Commonwealth Classic on the 22nd of April in Brisbane. We are pumped for this event and we can wait to see all of our athletes on stage again. Congratulations to everyone and the Model and Muscle tour must go on!!!!! ← PROCOMP 2018 WFF COMMONWEALTH CLASSIC TEAM RESULTS.